Consumer demands and expectations have long dictated the changes that come to the retail landscape. To stay afloat and meet their increasing needs, the retail industry is constantly evolving and facing both new challenges as well as opportunities spurred by the emergence of new technologies. Today, customers value service and customization more than ever. Most retailers are starting to provide much more convenience and personalization than before. Similarly, with the rise of AI and emerging technologies, businesses have begun to find ways to streamline the shopping experience online and on site. But, why is the adoption of new approaches important? Brick and mortar stores, for example, are not the alluring staples of the retail world that they once were. Not in the same way at least. On the other hand, the blows they suffered due to the rise of e-commerce allowed some businesses to reach record sales and connect with a much wider audience than ever before. For the businesses that were open to transition fully or partially online, the trade-off may have been worth it. This simple example illustrates how brands who want to remain successful must always be aware of the evolution of relevant technology and consumer tastes. They must also be open to considering the adoption of these new alternatives if the market trends suggest so. Retailers need to carefully tailor experiences online and in store for maximum benefits. The general retail trends tend to encompass changes that impact both areas, so their implementation needs to be uniform. New generations haven’t just changed their attitudes towards retail; they have also become a much more diverse and socially aware population. Retailers should pay special attention to this and would be wise to provide products and services that value individuals regardless of background, appearance or tastes. Opening up to new customer bases not only has the potential to increase clients, but also helps businesses sample from a much wider data pool to continue planning for the future. Going hand in hand with this lies the potential to engage with customers on a profound level by adopting practices that make the world a better place and that have a positive social, cultural or environmental impact. Not only does this create deeper connections with customers who share such passions, but it also leaves a helpful mark. While the challenge lies in remaining sincere, a brand can approach issues that make its customer base tick in an honest way for a much more meaningful customer-retailer experience. While there is often talk of the benefits of online vs on site sales, many customers prefer the option to do both. In addition, there is greater demand for initiatives that allow them to buy services or items online and pick up in-store, or even vice versa. Omnichannel is a good opportunity to expose consumers to fulfilling in store experiences while also presenting the convenience of buying online. This method helps the retailers gather meaningful data without sacrificing the opportunity to present the customer with unique offerings on site. Shopping at a conventional store is not as popular as in the past, but people still flock to these physical locations every once in a while. What they want, however, is something that they can’t easily obtain online. With material goods closer to our fingertips than ever before, we may find ourselves wanting to invest money and time in experiences, not just the products themselves. Simply put, even the latest products and luxury items don’t entertain us forever, but experiences become a part of who we are. We can share experiences with our friends and family, which makes us more likely to actively seek these out and much more likely to become loyal consumers of a particular brand. Stores where products can be sampled or where services are included as part of the shopping experience, especially those that focus on hospitality, are staying ahead by embodying this trend. Finally, with the rise of social media, the enticement also spreads through word of mouth or recommendations. So, setting up experiences and connections mentioned above should facilitate that. If businesses can provide a memorable service, people will gladly spread the word. According to Gartner, AI technologies will be in almost every software product by 2020. AI is an area with so much potential but an equally large array of offerings and opportunities make it difficult to predict where exactly it will play the biggest role. Cognitive computing, analytics and chatbots are some practical areas where AI can be implemented. Retailers spend a huge amount of their annual revenue on trade promotions. However according to Nielsen Holdings about 59% of trade promotions don’t break even. The fact of the matter is most retailers still depend on spreadsheets or gut or partial intelligence for running trade promotions and optimizing trade spend. Given the competitive retail landscape, companies can no longer afford ineffective promotions to hinder their revenues. In 2019 and beyond we can see more and more retail companies deploying Trade Promotion Optimization solutions (TPO solution) to measure the promotion effectiveness and profitably optimize trade spend. TPO solutions help improve the performance of trade promotions by powerful analysis and harnessing of influential data of multiple internal and external sources. Ultimately, Trade Promotion Optimization software is built to generate the maximum promotion ROI with a minimum trade spend. AI helps these solutions in the powerful harnessing of unstructured and structured real-time data generated from multiple sources. 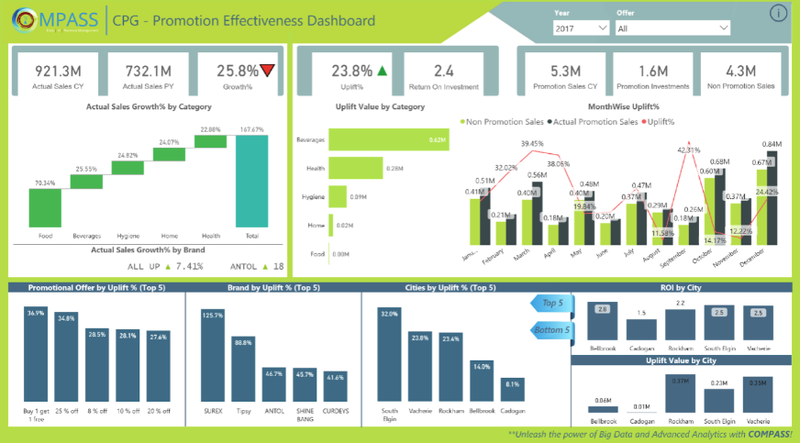 These solutions not only show the ROI and sales uplift generated by each promotion but also recommend which type of promotion where and when, for which brand. Users can also build what-if scenarios to predict sales uplift for different promotion combinations based on the chosen budget constraints. On top of providing customers with new and exciting experiences, cognitive computing technology allows businesses to more efficiently gather information for better decision making. Current tools, especially automation, eliminate the need for sales professionals to meticulously analyze trends or to manually enter data, eliminating the possibility of human error in the process. But, the benefits of cognitive computing don’t end there. Robots and computers falling in this category can also understand natural language and provide responses to common questions much faster than human retailers. Customers can interact with the technology and in turn, it can gather data that helps improve the customer experience in the future. Non-human sales assistants are at the top of the list when it comes to retail trends. Retail Bots are especially handy because they can construct welcome conversations and product discovery conversations. If needed, a human sales associate can jump into the conversation once the bot has gathered sufficient data or if additional action is needed, but at the very least a bot will help accelerate the buying process. Customers value convenience and saving time, so this is a welcome change to the buying process. On the same track, these bots can send reminders such as cart messages, allow customers to customize their orders through chat, and quickly order what they want. For the retailer, the information gathered is invaluable. Bots, coupled with powerful analytic tools, can really paint a picture of sales trends and even help predict buying patterns. The last trend to examine is one of the fastest growing in the retail industry, with an estimated growth of 1.6 billion dollars by 2025. AR and VR are being developed beyond entertainment purposes and into an invaluable tool for a more engaging retail experience. Both technologies can help consumers see products in context, preview features, or help them better customize desired products and also enable us to understand consumer preferences better. The widespread use of smartphones to look up prices has inspired some businesses to develop applications for use in-store. Harley Davidson, for example, developed an app that allows shoppers to view the motorcycle they are interested in with additional or different features. Nike allows customers to add custom designs on shoes, and to preview these before making the final product. The retail business transforms at a breakneck pace and companies that constantly align their business priorities with technology advancements can gain a serious competitive edge this 2019. Together with technology solutions and broader retail business trends, retailers can gain some key insights into today’s consumer base but also hopefully the changes that will come in the future. In doing so, retailers can hopefully provide a more pleasant retail environment that boosts sales and customer satisfaction. Meanwhile, staying on top of consumer demands and meeting their expectations helps meet present goals while setting up a company for future success. From inclusivity and conscious actions to TPO software to chatbots, these are the top retail business trends and retail technology trends to watch for 2019.